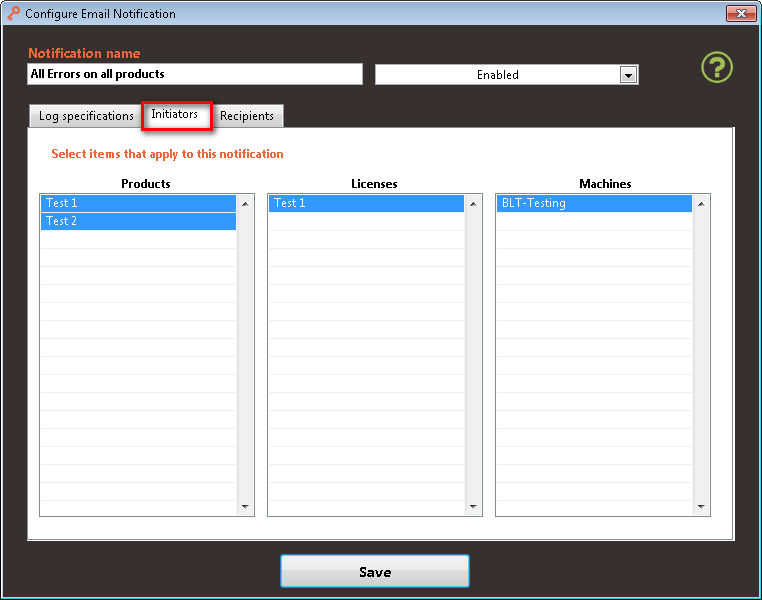 This section explains you how to configure a rule for sending Email Notifications based on Error and Logging information reported by your LabVIEW Products. See here how to create a new Notification and access the following page. Note that the Sender email address used to send these notification is the Licensee email address configured here. •Notification name: Specify the friendly name for this notification. This name will be used as the Subject for the email. •Enabled/Disabled: Use this attribute to make this Email Notification Active or Inactive. Use this section to define which Error or Logging message attributes you want to check for sending an email notification. oType: Select which type of logging should trig an email notification for this rule. oError Codes: Specify which error codes (coming from the error terminal) should trig an email notification for this rule. Leave the field empty for all error codes. oError Source: Enter a text that the error source (coming from the error terminal) should contain for triggering an email notification for this rule. oError Message: Enter a text that the error message (standard LabVIEW error message reported by the Simple Error Handler VI from the error terminal) should contain for triggering an email notification for this rule. oDebug Message: Enter a text that the debug message (coming from the debug message terminal) should contain for triggering an email notification for this rule. 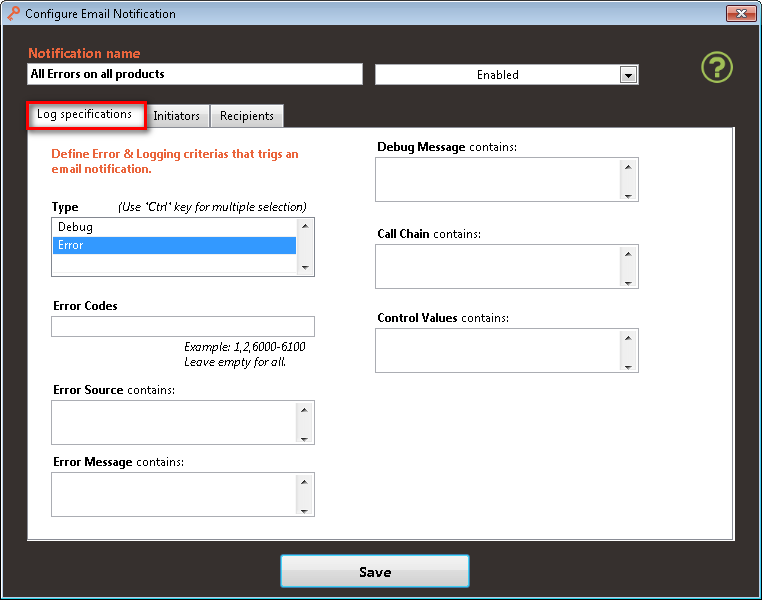 oCall Chain: Enter the name of a VI that should be in the Call Chain for triggering an email notification for this rule. oControl Values: Enter the label name of a control followed by its value (ex: Status: OK! for control label = "Status" and control value = "OK!"). If a control with this name and this value exists on the front panel of the VI that reports this logging information, an email notification will be send for this rule. Use this section to define which Products, Licenses or Machines should be included for this Email Notification rule. 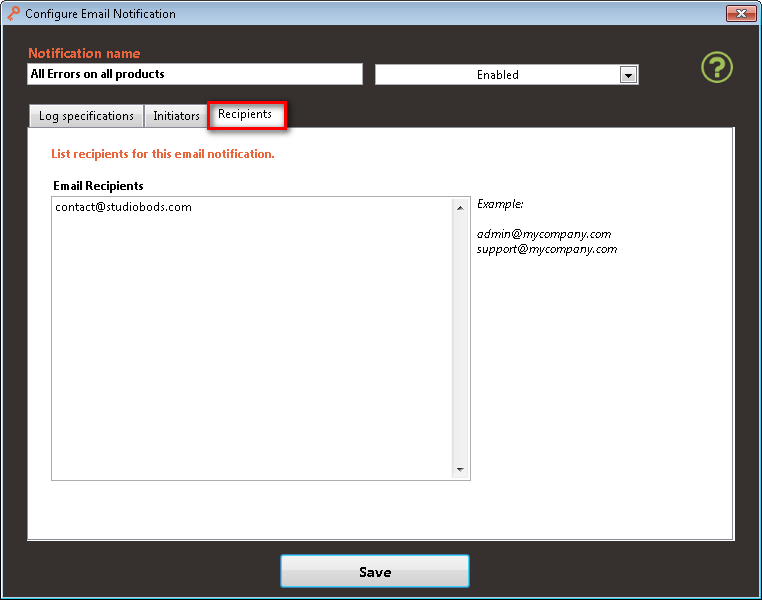 oSelect in each list for which items this Email Notification rule should be tested. If you select all the items of a list, any new item added in the future (for example a new License registered) will be automatically included in the notification rule. •Click Save to close this window and save the settings.